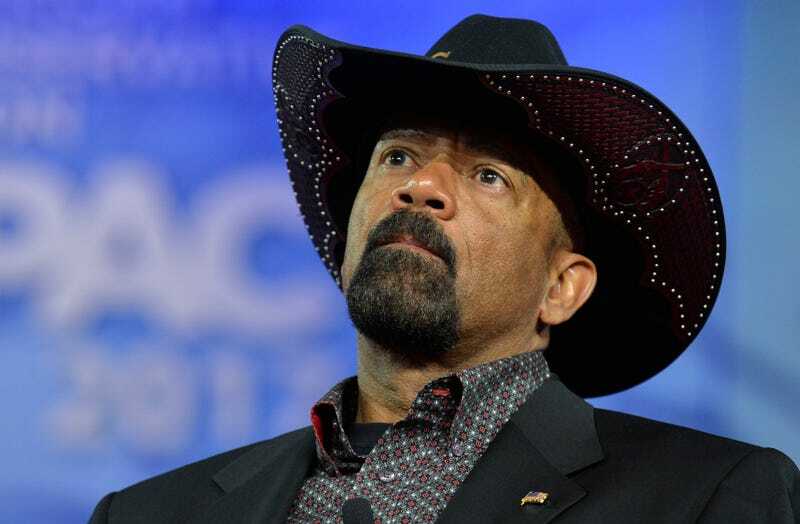 After a media outlet reported on plagiarism in his master’s degree thesis paper, Sheriff David Clarke is unsure of his standing with the Trump administration and whether or not he will actually get that job with the Department of Homeland Security that he’s been bragging about recently. On Saturday, CNN reported that there were 47 instances of direct quotes without quotation marks in Clarke’s 2013 thesis. According to Talking Points Memo, Clarke believes that the report is an attempt to intimidate him and undermine the Trump administration’s confidence in him. He called CNN’s reporting “a political smear” and said, “They’re saying certain words and phrases I should have put quotation marks around. OK, all right, fine,” during an appearance on The Sid and Bernie Show on Tuesday morning, according to TPM. Clarke would be an alarming choice to work in the Department of Homeland Security’s Office of Partnerships and Engagement, which coordinates federal outreach with local stakeholders. DHS officials have not responded on multiple occasions to TPM’s questions about any possible job offers extended to Clarke. It’s worth noting that CNN reports in all the instances they documented, while Clarke lifts language from sources and credits them with a footnote, he neglects to put quotation marks around the words he uses verbatim. Additionally, CNN contacted the Naval Postgraduate School about the reported plagiarism, and a spokesperson told the news network that standard procedure when an allegation of plagiarism is made is to launch an investigation into the thesis. Oops. Or people who understand what plagiarism is, Sheriff Clarke. Hopefully this gets this cartoon character up out of here once and for all.